This volume spans five centuries of post-Conquest literature, written at a time in which enormous social, political and linguistic changes transformed life in Britain. Medieval genres such as Arthurian romance, lyrics, dream narratives and mystery plays are brought to life and accompanied by discussions of key debates such as “Gender and Power”, “The Emergent Individual” and “Society and Class”. Bringing together historical contexts and critical theory, this is essential reading for any student of medieval literature. The York Notes Companion to Medieval Literature spans five centuries of literature written after the Norman Conquest, a time in which enormous social, political and linguistic changes transformed life in Britain. Introducing medieval genres such as Arthurian romance, lyrics, dream narratives and mystery plays in their social and historical contexts, the Companion explores examples from each genre in detailed commentaries, and guides students through key literary theories and debates. 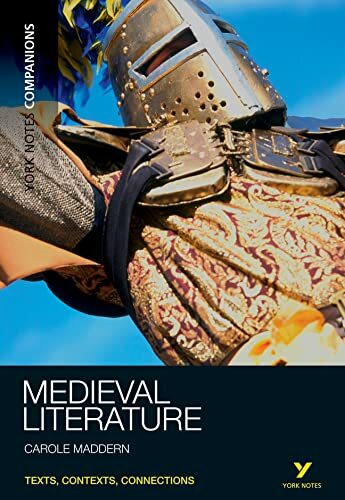 Connecting texts with their historical and scholarly contexts, this is essential reading for any student of medieval literature. Carole Maddern is a lecturer at Goldsmiths College, University of London, where she is convenor of Old English and Deputy Chair of the External Degree English Programme. Dr Carole Maddern has been a lecturer at Goldsmiths College, University of London, since 1994. She is currently convenor of Old English and Deputy Chair of the External Degree English Programme. She has extensive experience at teaching in many University of London colleges. She lectures on both Old English and Later Medieval literature and has written several guides for students for the University of London. She has also published with the London Medieval Society, which she helped to run for seven years. She has delivered many conference papers at national and international gatherings. Her main research interests are Medieval romance, women in Medieval literature, Medieval drama, and gender studies. She has a monograph entitled ‘The Figure of the Travelling Woman in Medieval English Romance’ which is being prepared for publication.